Jumping over fences must be a great workout routine, because Simon Pegg is absolutely shredded. 12 years after trying to get fit in Run Fatboy Run, the actor has undergone a dramatic physical transformation for upcoming movie Inheritance, which stars Pegg as a character named Morgan, alongside Lily Collins, Connie Nielson and Chace Crawford. The 49-year-old has been hitting the gym and working with a personal trainer for the last six months, in an effort to lose fat and define his muscles for the role, which requires him to be ‘lean, VERY lean’. He’s certainly looking the part now. Trainer Nick Lower shared a snap of the actor on Instagram, where he detailed the workout routine and revealed Pegg had lost 9kg (19.8lbs), as well as four per cent body fat since he began training. 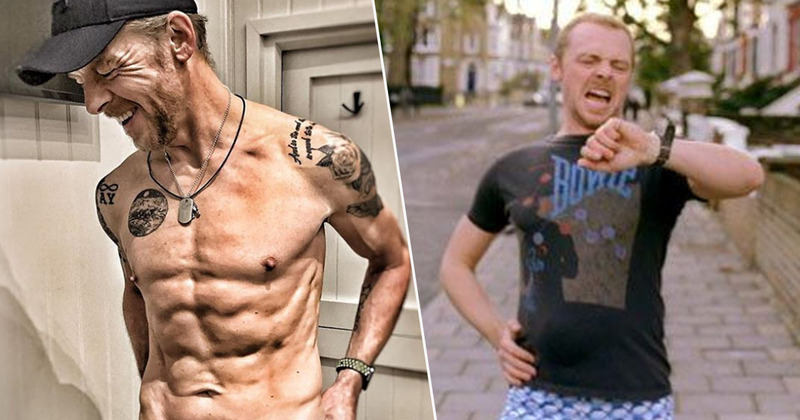 #SimonPegg 6 month body transformation for #InheritanceMovie. The brief for this role was lean, VERY lean. It required a specific body shape & look. Body weight: 78kg [down to] 69kg. Body Fat: 12% [down to] 8%. A mix of strength, circuits, core & 60km p/w trail runs! A sound nutrition plan that worked for him and his goals. Admittedly, it must be easier to commit to an intense workout like that when you know you’re being paid big bucks for the end result, but Pegg made it clear it wasn’t always smooth sailing. Pegg’s fans have been blown away by the impressive changes, with many complimenting the actor on his physique and posting witty puns related to his films. Hopefully Pegg will treat himself to a nice Cornetto once filming for Inheritance is complete, he deserves it!